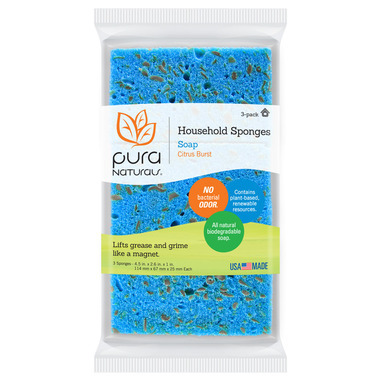 The Pura Naturals Household Soap-infused Sponge is great for everyday cleaning. Infused with an all natural degreasing cleanser, this sponge aggressively lifts grease and grime like a magnet. Simply add water and squeeze the sponge to activate, then clean, rinse, and reuse. Made from plant-based renewable resources, this sponge is biodegradable and helps eliminate waste caused by single-use cleaning products. Feel good (and clean good!) with this powerful and environmentally friendly household sponge. Ingredients: Cocos nucifera (Saponified Coconut oil), Carthamus Tinctorius L. (Saponified Safflower Seed Oil), Simmondsia Chinensis (Jojoba) Seed oil, Tocopherol (Vitamin E), Rosmarinus Officinalis (Rosemary) leaf extract, Citrus aurantium dulcis (Orange) Peel oil, Citrus sinensis (10 fold orange) Essential Oil, Citrus aurantifolia (Lime)oil. Love this eco friendly sponge. The natural soap smells amazing and the sponge is resistent. Great product!